How do you like your Eastern European music: precise or ramshackle? 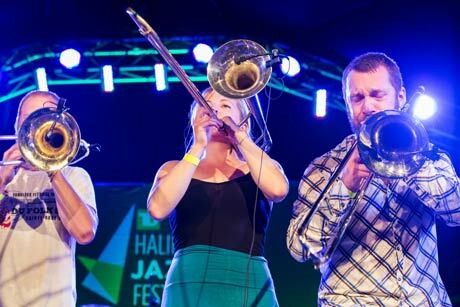 Halifax Jazz Fest attendees got a little bit of both on Tuesday night (July 8) as the festival offered up its second of its three scheduled free concerts, featuring two acts that fuse together klezmer, jazz, folk, rock, punk and a slew of other genres in a global smorgasbord of sound. Though it was Toronto's Lemon Bucket Orkestra that topped the bill, Halifax's own Gypsophilia, who opened, seemed to attract the larger crowd — likely because, as the sun went down and the night grew chilly, the "free" show came with a bit more of a physical cost. The instrumental group is a regular on the city's music scene, and marking its tenth anniversary, but despite the familiarity still managed to get the crowd up and dancing to songs like "Jewish Dance Party" and "Horska." The highlights, to my ears, were the subtler moments, like a beautiful take on "Agricola & Sara," performed with the song's heartbreaking stop-motion animation video playing alongside. In contrast, the Lemon Bucket Orkestra offered few, if any, moments of restraint; the 15-piece ensemble performed a set that was full of boisterous, cacophonous punked-up takes on traditional material from Macedonia, Russia, Ukraine, Bulgaria… even New Orleans. "We never do a setlist," frontman and ringleader Mark Marczyk told the crowd. "We just go with the flow." At times that flow felt a bit stilted, and the set flirted with being outright overwhelming; perhaps it was the fatigue of this being halfway through the festival, but I kept looking for moments that would draw me in rather than spend all their energy trying to blow me away. I found a pleasant handful of them — a wonderfully tense trombone solo duel, for example — but ultimately the Orkestra's intense communal spirit carried the day. And who am I to argue, especially when that spirit resulted in a show-ending 20-plus person jam with Gypsophilia that then left the stage for the Halifax waterfront, leading fans literally dancing off into the night?